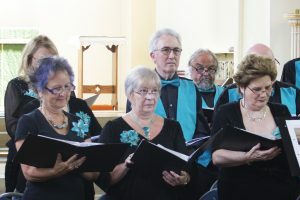 It was a big welcome back for the Orphean Singers, a firm favourite of TT@TT concertgoers, and their opening song, ‘Beauty and the Beast’, showed why they are so popular, showcasing the gentle harmonies so much part of this musical group. A powerful rendition of ‘Can’t Help Falling in Love with You’ followed, beautifully accompanied by the pianist, Hannah. The first soloist, Paul, performed ‘Bring Him Home’ from Les Miserables, so clearly highlighting the poignancy of this song. It was a very moving solo. Next, the singers performed two ABBA songs, ‘Money’ and ‘Mama Mia’, before Marilyn sang ‘Send in the Clowns’, a challenging melody, but so expertly delivered, delicately showing the pathos of the song’s message. We were then given a spirited and unusual version of ‘Old MacDonald had a Farm’ – a lot of fun – and ‘The Way to Amarillo’, another favourite. The pianist, Hannah, treated us to a Debussy’s ‘Reverie’, a piece that clearly showed the composer’s trademark elements, very expressively played. Christine then sang ‘Your King and Country Wants You’, a WW1 recruiting song, with the audience joining in the chorus. This was followed by a compilation of WW1 songs and, again, the audience joined in enthusiastically – a proper sing-a-long. 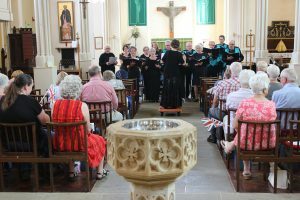 Very grateful thanks go to all the singers for their vibrant and engaging performances, to the three impressive soloists, Hannah for her wonderful accompaniment, to Andrew for his informative and fun introductions and Kath for her expert conducting. As always, thanks also to Fiona and Jean for serving refreshments and to Lesley for arranging the concert.